Parkland Industrial Hemp Growers have unveiled their plans for a new $15 million agfibre processing facility to be located in Dauphin, Manitoba. The proposed facility --Parkland BioFibre -- will process locally-grown hemp straw into fibre products using a zero-waste system developed by BioFibre Ltd. of Bangor Wales, in cooperation with the BioComposite Centre at the University of Wales. Keho Products Ltd. of Alberta will build the plant, calculated to be a turnkey-type operation. The long-term objective will be to franchise the plant's technology across North America. The proposed franchiser -North American BioFibre-- will also involve Transfeed Inc., an Olds, Alberta-based exporter of compressed Timothy Hay. . The plant will process fines, core and long fibre. Fines will be diverted to make briquetting. Shives will be separated, cleaned and baled. Long fibre will be separated and be used in horticultural mat processing. To fill plant capacity, up to 48,000 tonnes of raw material will be needed, requiring between 16,000 and 24,000 acres of hemp to be grown annually. Parkland says that close to 18,000 tonnes of hemp straw is currently in inventory on area farms. Parkland BioFibre is counting on member-supplied fibre and $50,000 CDN worth of land from the local government, coupled with $2 million CDN in cash investment. Loans and provincial "Incentive Assistance" will provide the majority of financing for start up. Once the plant is in full production, gross sales are projected to be $13 million CDN a year. Parkland is armed with a letter of intent for 12,000 t of shives (core fibre/hurds) per year for three years. Markets tests are underway for matting; Parkland is also involved with testing for paper fibre in the US. Currently, existing fibre industries in Manitoba such as Winkler-based Schweitzer-Maudit and Elie's Isobord rely on purchasing flax and wheat straw crop residue at minimal prices. This gives farmers additional income, but is not a reason in itself to grow the crop. The proposed Parkland BioFibre facility will be an innovative addition to Manitoba's fibre processing sector. In addition to creating economic and employment benefits as a result of value-added processing, it will also create an opportunity for farmers to diversify their crop mixes. The economies of this project are such that farmers can produce industrial hemp as a stand alone fibre crop. II) So Where's the Hemp? Industrial Hemp has been grown commercially in Canada for the past 4 years. However, very few farmers chose to grow in 2001. In its 4th year of production as an alternative crop in Canada, very little industrial hemp was grown across the country. According to statistics released by Health Canada, 92 cultivation licenses for 1300 hectares were granted this year. The downturn in fresh production is attributable to overproduction in 1999 and 2000 (where 13,000 and 5,500 h. were licensed) and questions about the openness of the US marketplace. Observers of new crops note that this boom or bust scenario is not isolated to hemp: crops such as Echinacea and ginseng have also experienced dramatic fluctuations in recent years. The raw numbers indicate other trends at work, which speak well for the future of this young industry. The 2001 figures identify 51 licensed processors, a climb from last year's 48 and the granting of 24 licenses for export, a doubling of 2000's figures. Processing activity of all types is increasing incrementally, so business there is steady. The doubling of export licenses suggests more companies on both sides of the border buying and selling derivatives like oil, dehulled, and other seed product. A visit to the health food store or surf or the Internet confirms that more hemp is reaching the market. And companies in the sector are reporting steady growth. So hemp is happening, it just may not be happening as fast as we want it too. Ag Canada believes that attitude just might make the difference. AAFC conducted a cross country survey of Canadian hemp growers and processors, concerning their commercial activities in 2000. In the survey's conclusion, the report reads " Despite modest growth since industrial hemp was legally commercialised, growers and processors are optimist and confident about the economic future of the industry. The continued high level of motivation and perseverance of the innovators amongst them is a key factor in this sector reaching profitability. " The survey accounts for many of the obstacles facing the young industry over the past few years, including dealing with the 1999 surplus, lack of access to capital, concerns about domestic regulations and US market access and a general lack of infrastructure. In hemp's favour, the survey found a growing consumer acceptance of hemp products, and increasing education on media, public and political levels. Respondents -- most of them processors -- thought the hemp sector was generally healthy. To read the full survey, download here. Calgary, Alberta-based Nutris In. has entered into an agreement with the Institute of Bast Crops of Hlukhiv, Ukraine. The agreement covers research, technology cooperation and marketing related to hemp and includes territorial rights and seed selection toward the development of new varieties. "This agreement brings Nutris Inc. and the Institute of Bast Crops into a positive and meaningful relationship, which will benefit hemp production, processing and marketing in Canada, Ukraine and other countries," says Allan Dolan, CEO of Nutris. The agreement provides for the creation of joint varieties and royalty protection on new and current varieties. Pavlo Holoborod'ko, Director of the Institute of Bast Crops states "Ukraine has extensive experience in the production, processing, and research of hemp, which needs to be marketed in other countries and further developed to reflect local conditions". The agreement is until December 31, 2005 with a provision for renewal. Nutris Inc. is a private Canadian corporation developing proprietary interests and strategic alliances throughout the new agricultural crop value chain. The company's goal is become the preferred, vertically integrated, supplier of novel value added ingredients and products to the functional food, nutraceutical and cosmetic industries as well as other industrial concerns. The Institute of Bast Crops was organized in 1931 as the All-Union Scientific and Research Institute of Bast Crops to study problems related to the cultivation, harvesting and processing of hemp. The Institute together with its predecessor has for 70 years investigated the problems related to hemp plants, researched selection and genetics, developed methods of hemp growing for different soil and climatic zones, developed technologies for harvesting stalks and seeds, primary fibre processing, and has designed harvesting equipment. The Institute also produces the seed necessary for certified and commercial production. Pavlo Holoborod'ko's paper Hemp research and growing in Ukraine can also be seen on their web site. Is there an opportunity ? Changing environmental realities and new technologies are helping to build the demand for alternative fuels derived from plant sources. 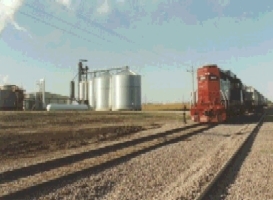 Bioenergy options include both ethanol and biodiesel production. Most cars with internal combustion engines can run on blends of ethanol and petroleum; with the spread of "flexible fuel" vehicles and the introduction of innovative fuel cells in the near future, ethanol only powered cars will become commonplace. Biodiesel fuels are suitable for heavy trucks, tractors, buses, vans and marine vessels equipped with a diesel engine; little or no modification is required to use biodiesel. Ethanol can be produced either from grain or cellulose sources via chemical or biological methods; biodiesel is produced by reacting vegetable fat or oil with an alcohol in the presence of a catalyst. Currently, 228 million litres of ethanol are produced in Canada annually -- all from grain sources. The Saskatchewan Research Council has been analysing this market and industry and according to research released last year, it could be blown wide open. With recent advances, ethanol could be produced efficiently and at a low cost -- potentially as low as $0.20/litre CDN. Researchers have been evaluating different methods of cellulose-to-ethanol production, including agwaste and dedicated fibre crops such as hemp and hybrid poplar. The possibilities of biofuel to stimulate the rural economy in Saskatchewan for example are provocative; one " low end" scenario of 8.7 billion litres of ethanol production per year, and spread out over 400 plus plants would create an estimated 15 jobs per plant (6000 jobs), or around one job per 0.75 million litres produced. Fitting hemp into a bioenergy plan will likely incorporate both uses of the plant, seed and fibre. This summer Hempcar's epic Transamerican journey (see www.hempcar.org) did much to promote help as a biofuel. Ironically, because of hempseed's nutritional and dermaceutical properties, hempseed's best value may not be found in bioenergy production scenarios. But developing hempseed markets will insure agfibre supply. As a champion of biomass production, hemp would be an ideal feedstock for cellulose-based biofuel production. Small steps towards more sustainable energy production are being taken across Canada by the top two levels of government, such as with the two in province windpower installations announced for Saskatchewan this year, and the federal government's stated intent to quadruple national ethanol production over the next 5 years. But the capabilities exist for much more. And despite the Texas oil interests in the White House, the USA is moving ahead of its northern neighbour in alternate energy projects (for good info see U.S. Department of Energy's (DOE) Energy Efficiency and Renewable Energy Network http://www.eren.doe.gov/). The emerging biofuel economy will provide opportunities for producers to organise into cooperative business structures. f) promotes local energy sufficiency and hence enhance food security. Strong local economies are the bedrock of true sustainability. A version of this article was published in the Saskatchewan Hemp Report Fall 2001 newsletter. by Jason Freeman, General Manager BioHemp Ltd and Hemp Report Co-Publisher. 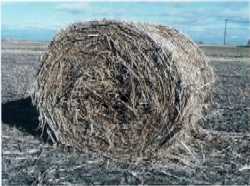 There are four derivatives of industrial hemp cultivation that are suitable for feed. They are: whole seed, seed meal, oil and fibre. The whole seed will provide the highest nutritional bang for your feed buck because it provides both high quality protein in the form of essential amino acids and fat in the form of PUFAs (polyunsaturated fatty acids). Prices for seed into the bird feed market range from between $0.10/lb for inferior Chinese grown seed to $0.45/lb for superior quality Canadian grown seed. The meal and oil are derivatives of the seed and therefore are an excellent source of protein and beneficial fats respectively. However, the oil is a high cost feed and may be more suitable to higher end applications such as the pet and thoroughbred horse markets. The meal, a byproduct of the pressing process, must compete with canola and soy meal on price. 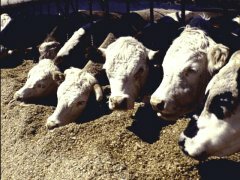 There are some advantages with hemp meal over soy or canola, mainly that the protein is more easily digestible and therefore hemp meal does not need to be cooked before using it as feed. But until these benefits are accepted by the marketplace hemp must be competitive with both canola and soy and therefore priced between $0.06 to $0.15/lb. According to Alberta Agriculture, hemp fibre used for silage makes an excellent feed and has the following nutritional profile: protein 19.4%, calcium 1.87%, phosphorus 27%, ADF 40.9%, Mcal/lb. 1.17. Depending on when you harvest, your hemp silage prices should range from between $45.00/MT for post-seed fibre to over $100.00/MT for pre-seed fibre. However, markets have not been established for hemp silage and therefore these prices are based on the going rate for alfalfa -- another high quality silage. It is also important to note that currently it is illegal to sell hemp for feed as it is not registered as an approved feed by Agriculture and Agri-Food Canada. A number of companies including BioHemp are currently going through the application process but are reluctant to pay the fees associated with the application process until the marketplace shows interest. However, it is legal to provide hemp feed for research purposes and this research, because of hemp's exceptional nutritional profile, will inevitably lead to interest in the marketplace. The Earth Friends (TM) :"Saving the Planet One Heart at a Time" is a line of rag dolls made from natural and recycled materials. This is a sweet toy with a very cool idea around it: with one hug, children can begin to hold the idea of sustainability close to them. There are 9 kinds of Earth Friends; all of them come in 22 inch or 14 inch sizes. A wide range of accessories supports both sizes. Recommended for ages 3 and up. How Do I Get Free Advertising in the Hemp Report? Every month, we get notice of new product releases, press notifications and new product queries from companies across Canada, the US and Internationally. Sometimes we are able to work notice of these new products into our editorial lineup, but much of the time we are hard pressed to fit everything in to a given issue. So we are pleased to present our second annual New Products Feature, which we aim to have webready by February 11th, 2002. The Hemp Report's New Products Feature is an ideal way to show your new stuff to The Hemp Report's readership (which includes retailers, manufacturers, distributors, journalists and consumers of all kinds). Here's how it works: send us an email to our slave/Editor-In-Chief arthur@hempreport.com with the message header New Products Feature. In the message body include a 100 word long message about all your new products that you released over the past year (The 100 words quota is per company, not per product). Please include full contact information about your company (who you are, your address, your phone, fax, email and web as applicable). Full bragging rights apply. Please note that you are responsible for all claims not us. Deadline for inclusion: January 31st, 2002. NO EXCEPTIONS. Please send us 100 words; do not assume we will write up your product if you do not send us 100 words. If your copy is over 100 words, we assume editorial privileges and yes, edit. Can I submit picture? If you have advertised with The Hemp Report over the last calendar year, we will gladly include a picture of your product (thank you for supporting us) in our feature. If you send us a sample of your product (or have sent us samples over the last year), we will also be glad to post a picture as well. Please snail mail all samples to our head editorial office at #13-2255 Smith St. Regina, SK, S4P 2P5. Contact jason@hempreport.com about paid advertising opportunities. Reminders: we will be sending out a reminder notice in January, but early birds are always welcomed.